The NatNet SDK is a networking software development kit (SDK) for receiving NaturalPoint data across networks. It allows streaming of live or recorded motion capture data from a tracking server (e.g. Motive) into various client applications. Using the SDK, you can develop custom client applications that receive data packets containing real-time tracking information and send remote commands to the connected server. NatNet uses the UDP protocol in conjunction with either Point-To-Point Unicast or IP Multicasting for sending and receiving data. The following diagram outlines the major components of a typical NatNet network setup and how they establish communication between NatNet server and client application. For previous versions of NatNet, please refer to the provided PDF user guide that ships with the SDK. NatNet Library:	Native C++ networking library contents, including the static library file (.lib), the dynamic library file (.dll), and the corresponding header files. NatNet Assembly:	Managed .NET assembly (NatNetML.dll) for use in .NET compatible clients. NatNet Samples:	Sample projects and compiled executables designed to be quickly integrated into your code. A NatNet server (e.g. Motive) has 2 threads and 2 sockets: one for sending tracking data to a client and one for sending/receiving commands. NatNet servers and clients can exist either on a same machine or on separate machines. Multiple NatNet clients can connect to a single NatNet server. When a NatNet server is configured to use IP Multicast, the data is broadcasted only once, to the Multicast group. Default multicast IP address: 239.255.42.99 and Port: 1511. IP address for unicast is defined by a server application. The Sample folder, contains Visual Studio 2013 projects that use the NatNetSDK libraries for various applications. These samples are the quickest path towards getting NatNet data into your application. We strongly recommend taking a close look into these samples and adapt applicable codes into your application. More information on these samples are covered in the NatNet Samples page. The include folder contains headers files for using the NatNet SDK library. \include\NatNetTypes.h NatNetTypes.h header file contains the type declaration for all of the data formats that are communicated via the NatNet protocol. \include\NatNetClient.h NetNetClient.h header file contains declaration of the NatNetClient class, which is the key object used in the SDK. This object must be initialized in order to run a client application for receiving the data packets. \include\NatNetRequests.h NatNetRequest.h header file contains a list of NatNet commands that can be sent over to a server application using the SendMessageAndWait function. \include\NatNetCAPI.h NatNetCAPI.h header file contains declaration for the NatNet API helper functions. These functions are featured for use with native client applications only. NatNet library files are contained in the lib folder. When running applications that are developed against the NatNet SDK library, corresponding DLL files must be placed alongside the executables. \lib\ This folder contains NatNet SDK library files for 32-bit architecture. \lib\x64 This folder contains NatNet SDK library files for 64-bit architecture. Native NatNet library for 32-bit and 64-bit platform architecture. These libraries are used for working with NatNet native clients. Managed NatNet assembly files for 32-bit and 64-bit platform architecture. These libraries are used for working with NatNet managed clients, including applications that use .NET assemblies. Note that this assembly is derived from the native library, and to use the NatNetML.dll, NatNetLib.dll must be linked as well. Includes XML documentations for use with the NatNetML.dll assembly. Place this alongside the DLL file to view the assembly reference. NatNet class and function references for the NatNetClient object. List of tracking data types available in the NatNet SDK streaming protocol. Tip: Code samples are the quickest path to towards getting familiar with the NatNet SDK. Please check out the NatNet samples page. List of NatNet sample projects and the instructions. Timecode representation in OptiTrack systems and NatNet SDK tools. 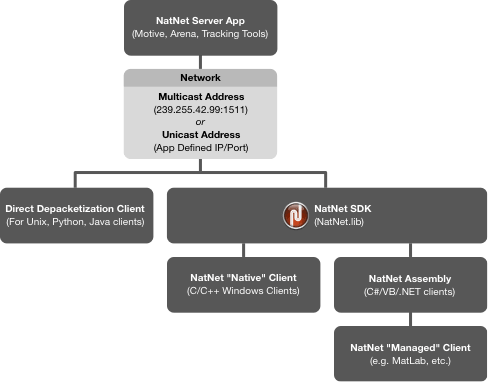 A general guideline to using the NatNet SDK for developing a native client application. A general guideline to using the NatNet SDK for developing a managed client application. In streamed NatNet data packets, orientation data is represented in the quaternion format (qx, qy, qz, qw). In contrast to Euler angles, Quaternion orientation convention is order independent, however, it indicates the handedness. When converting quaternion orientation into Euler angles, it is important to consider and decide which coordinate convention that you want to convert into. Some of the provided NatNet samples demonstrate quaternion to Euler conversion routines. Please refer to the included WinFormSample, SampleClient3D, or Matlab samples for specific implementation details and usage examples. Axes: Static (Global) or relative (local) axes. Important Note: Use of the direct depacketization is not recommended. The syntax of the bit-stream packets is subject to change, requiring an application to update its parsing routines to be compatible with the new format. The direct depacketization approach should be used only where the use of the NatNet library is not applicable. The NatNet SDK 3.0 update involves bit-stream syntax changes with the addition of analog data and other functionalities in the protocol. This will require corresponding updates for programs that utilize the direct depacketization approach for parsing the streamed data. In situations where the use of the NatNet library is not applicable (e.g. developing on unsupported platforms such as Unix), you can also depacketize the streamed data directly from the raw bit-stream without using the NatNet library. In order to provide the most current bitstream syntax, the NatNet SDK includes a testable working depacketization sample (PacketClient) that decodes NatNet Packets directly without using the NatNet client class. For the most up-to-date syntax, refer to the PacketClient sample, or use it as a template for depacketizing NatNet data packets. Adapt the PacketClient sample (PacketClient.cpp) to your application's code. Regularly update your code with each revision to the NatNet bitstream syntax.